You should read this book before you use this or any other sharpening system. 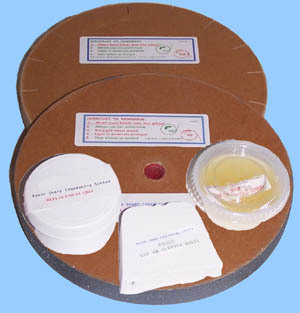 A copy is available for only $9.95 including shipping when you purchase a set of paper sharpening wheels, see below. Sharpening knives with paper wheels is very fast. The time to sharpen an average dull kitchen knife is about one minute. To sharpen very blunt knives I recommend using a Tormek or other wet grinder first to re-grind the correct bevels. This reduces the chance of overheating the blade, speeds up the sharpening, and extends the life of the gritted paper wheel. It takes advantage of the strong points of both systems. I use paper wheels a little differently than recommended by the manufacturer. Here is how I modify a bench grinder for use with paper wheels. First, buy a dedicated 3600 rpm grinder for your paper wheel system. Changing the wheels too often can introduce wobble in them. Buy a 6-inch grinder to use 8” paper wheels. The extra clearance is needed when sharpening long blades. Buy a grinder with removable guards because the guards will taken off. Removable guards are usually sheet metal, while permanent guards are often part of the motor housing casting. Don't go too cheap - expect to pay $60 to $80. Avoid lights, they make it hard to turn the grinder around as described below. Normally a grinder wheel turns toward the user and grinding is done on the front. I prefer to reverse the grinder so the wheel turns away from you and work on the top of the wheel with the edge away from you. This allows you to see what you are doing, and debris will be thrown away from you. If your grinder has a removable base, and most do, you can remove it and turn it around so the switch is on the front side. Hold the blade level and work near the top for a small angle, down the wheel closer to you for a larger angle. I've marked angles of 0, 15, 20 and 25 degrees on my wheel. (See picture.) When the blade is held horizontal the angle between the blade and the wheel is equal to the angle between the point of contact and vertical (equal triangles). Put zero at the top and position the blade at the angle mark you want to grind before you start the motor. Then turn it on and hold the angle steady as you move the knife. Practice a little and you will learn how to hold the blade to get the proper angle. Paper wheels seem to produce a sharp edge even though the angle is not well controlled. Put a good light over the grinder so you can see the burr as it develops then polishes away. CAUTION: Safety glasses and other protective equipment should always be worn when using any high-speed sharpening equipment. A final note: Because the wheel is moving off the edge, it can cause a non-locking folding knife to snap closed, so be sure your fingers are safely positioned on the sides of the knife handle. Below are two descriptions of how to re-grit your wheel. The gritted wheel will eventually need to be re-gritted. The manufacturer estimates they will sharpen 300 to 400 knives, but if you like them to be aggressive you will re-coat after 150 to 200 knives. I only use mine to refine the burr after I have ground the bevels on another grinder. I estimate their life in my application over 1000 knives. Sand old grit from the wheel on your grinder. Use 36 grit sandpaper wrapped over a piece of 2x4. It is slow at first, but do not be tempted to use a file or rasp. The wheel will eat the teeth right off a file. Just keep using a fresh spot in the paper and keep at it. When you get to the paper it will start getting dusty. Use a mask or work outdoors. Finish with 60 grit. Sand the polishing wheel while you are at it. Spread the grit in a row on a piece of newspaper. Remove the wheel from the grinder and coat it with white glue until you get a thin moist layer. It will take 2 or 3 passes because the paper soaks out the water. Elmer's works well. Put your fingers in the arbor hole and roll the wheel through the grit. Some sprinkle, but I prefer this way. Hang the wheel up to dry overnight - back on the grinder is fine. Pick up the edges of the newspaper and pour the grit back in the bottle for future use. The next day rub wax into the grit by hand. I like to start with enough to hide over 50% of the grit. The mfg says use less; some use more. If you try to do this with the grinder on, it will just spray wax around the room. Mount the wheel on the grinder. Spin it by hand to check any wobble, and rotate it 1/8 turn until you find the best position. Tighten the nut. Turn on the grinder, and use a piece of scrap metal to knock the high points off the wheel. This should be something thicker than a knife. I have used an old wrench and now use an old chipper blade. Then knock off the ridges on the corners where the glue and grit have overlapped the edge. These ridges will cut you if you accidentally touch the spinning wheel. You are ready to sharpen. Option 2 - new gritted wheels are available for $34.00 plus $9.95 shipping. You should keep a spare on hand. Click here for spare parts. 1. Wrap some 36 grit sandpaper around something like a crescent wrench handle or flat file, start your motor, & sand the wheel down to bare paper. Make sure all of the old grit, wax & glue is off. Then switch to 60 grit sandpaper and make the wheel smooth, taking care to make sure it's flat across the front. Then sand the edges a bit to take the "fuzz" off. 2. Turn off your motor & apply a bead of Elmer's white glue down the middle of it while hand turning. Then smooth the glue out with your finger until you have an even, fairly thin coat of glue on the wheel. You should see the laminate lines through the glue layer. 3. Put some newspaper under the wheel to catch the extra grit. 4. While hand turning the wheel, carefully sprinkle the grit on the wheel until no more will stick - until it's sloughing off. Tap the wheel a few times while hand-turning it to knock off the loose grit, then collect the excess grit in the newspaper & pour it back in the grit cup. 5. Leave the wheel alone for at least 24 hours and you have a new wheel. 6. If there is a bump in the grit – DO NOT touch it while the glue is wet. After it's dry, touch it a bit with some 60 grit sandpaper while it's running & it'll smooth right out. Our wheels do not come pre-waxed. Our hard, yellowish wax is for use on the gritted wheel to help control heat & help the grit stay on longer. With a new wheel (or newly re-gritted), hand turn the wheel and rub some on. Do not completely cover the grit, as it will hinder the steel cutting function. Each time you come to the wheel with a different blade, simply touch the running wheel briefly with the wax. This keeps some wax on the wheel. Ideally, there should always be streaks of wax & grit on the wheel. If you cover the the grit entirely, there are two choices: 1) sand down & re-grit the wheel, or 2) work on it with something hard like a kindling ax & wear the wax off a bit.